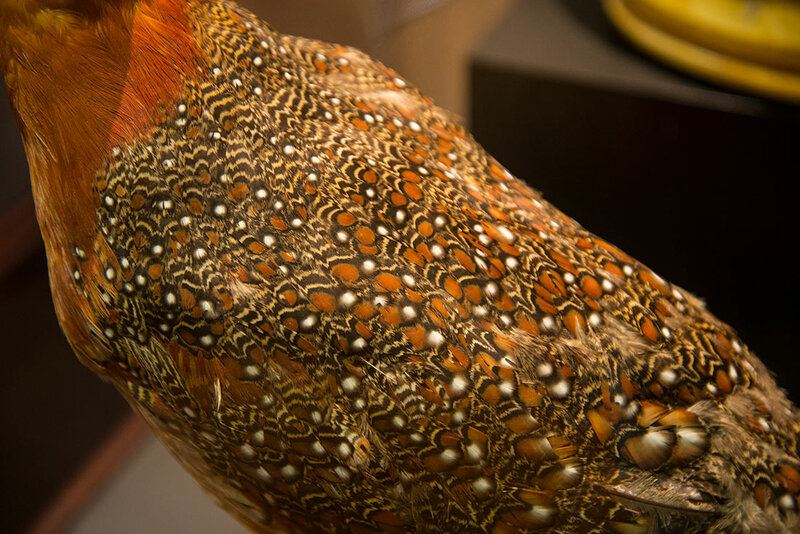 Above, a bright pattern of feathers on a bird specimen at the Monte L. Bean Museum at Brigham Young University. Of all living creatures, only birds have feathers, Those soft, delicate wonders of nature perfectly combine form and function to allow birds to perform that most magical of motions - flying. 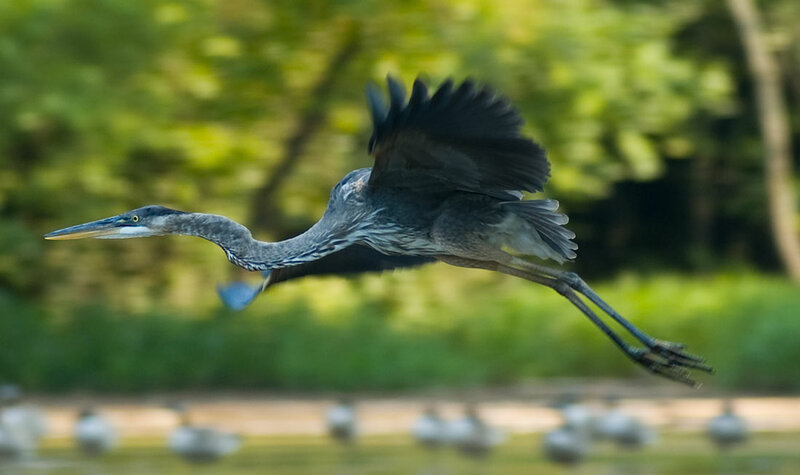 A blue heron flies over a lake in North Carolina. 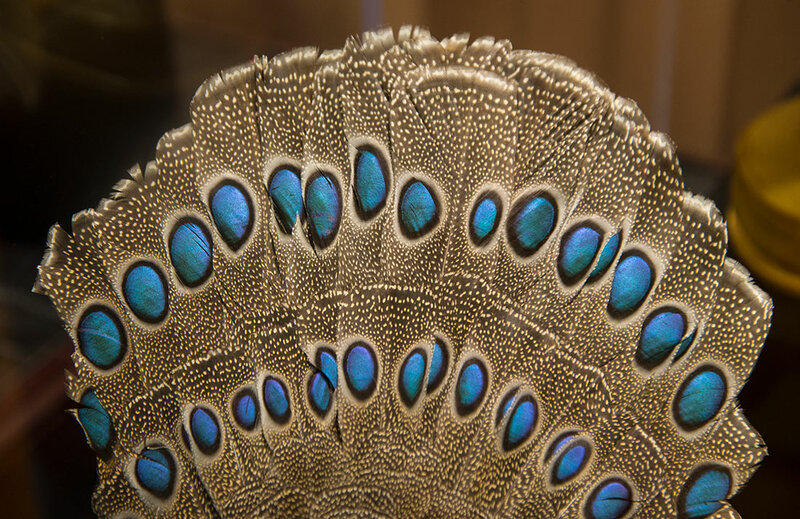 Feathers come in a huge variety of shapes, sizes and colors, but they fall into five basic types, each with a different function - wing, tail, contour, semiplume and down. They perform crucial the crucial functions of flight, insulation, camouflage, display. 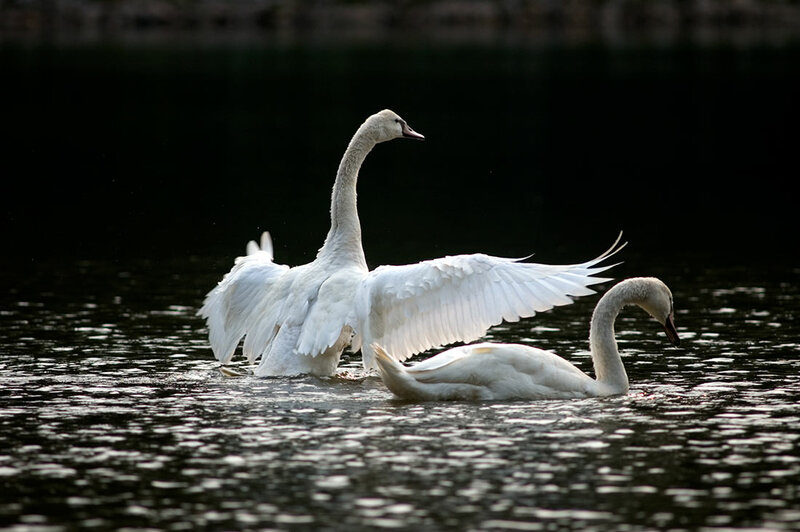 This swan spreada its wings on a pond in North Carolina, demonstrating several differnt types of feathers on a single bird. Wing feathers are assymetretical, with one side short and one long to provide birds with aerodynamics they need to fly. 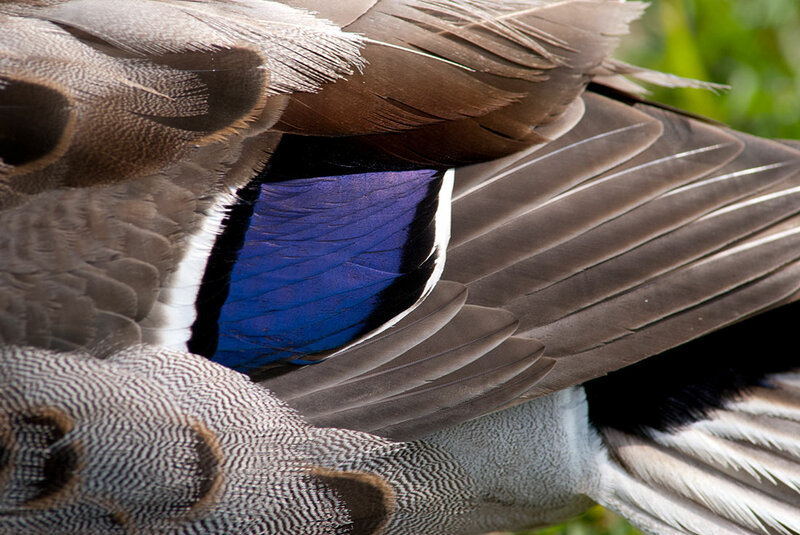 Wing feathers have interlocking structures that create a uniform surface that allows lift. Wing feathers are finely honed instruments that enable birds to not only fly for long distances, but to fly in precise formations, land gracefully on specific small targets and dive at their prey. 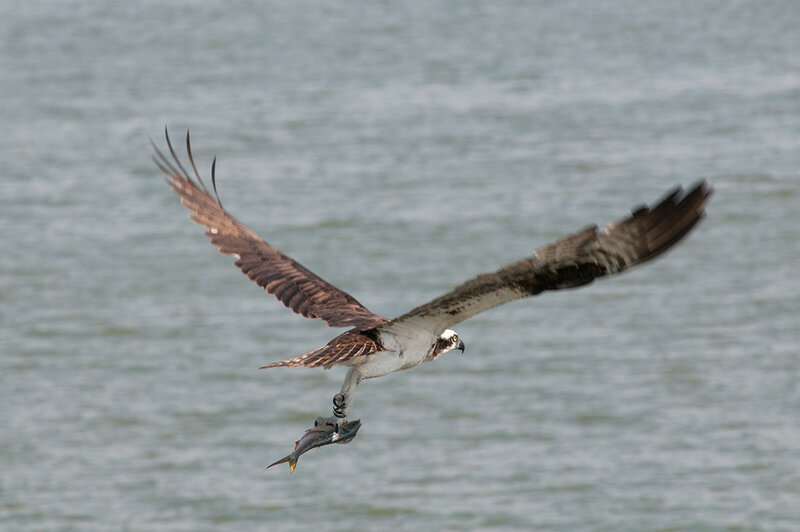 A osprey over the Chesapeake Bay soars upwards after nailing a fish. Tail feathers have a symmetrical strcture that also interlocks similar to Velcro to form a surface that enables birds to steer when in flight. 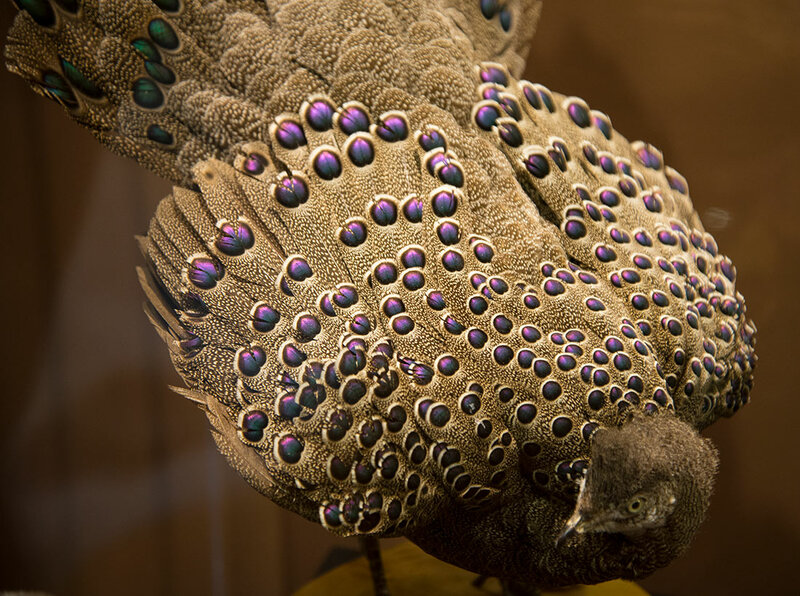 This photo from the Monte L. Bean Museum shows the symmetrical nature of tail feathers. Contour feathers cover a bird's body and interlock to help keep it dry. These feathers have a downy part at the base to keep a bird warm close to its body. This specimen from the Monte L. Bean Museum demonstrates the various types of feathers a bird has. Semiplume feathers are not visible. They are tucked beneath the other feathers and help the bird stay warm. Downy feathers have also keep birds warm in the wind by trapping their body heat and creating a waterproof barrier that keeps the bird dry. 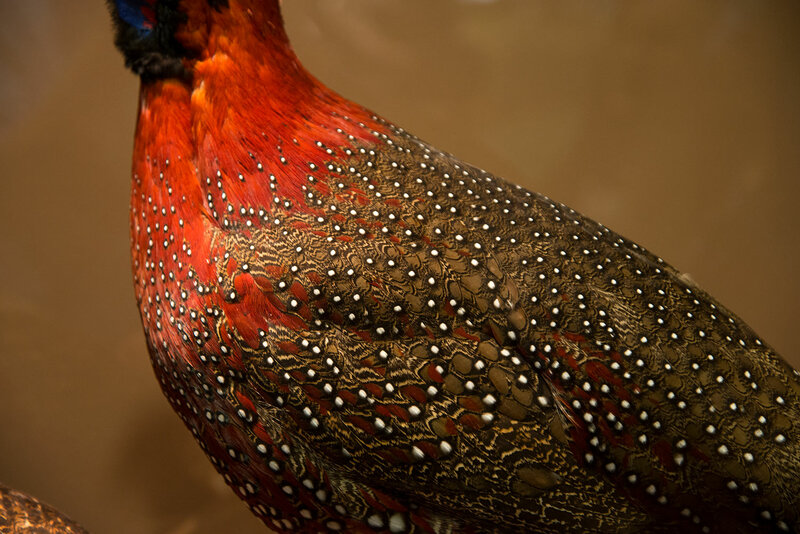 In addition to their functions, feathers have a visual purpose. They help birds either blend in or stand out. 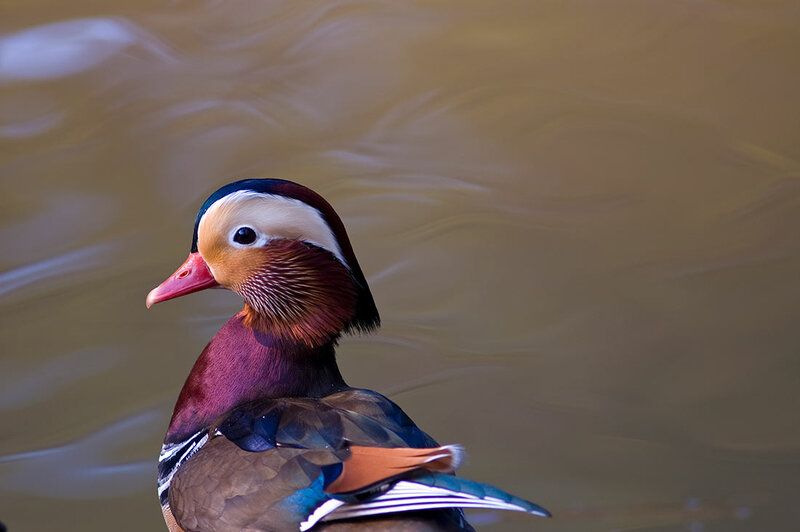 A brightly colored Mandarin duck at Duke Garden in Durham, North Carolina. A spot of blue breaks up the dull colors of this bird wing. Patterns on a bird specimen's wings at the Monte L. Bean Museum. This specimen at the museum demonstrates the wide variety of feathers that can be seen on a single bird. 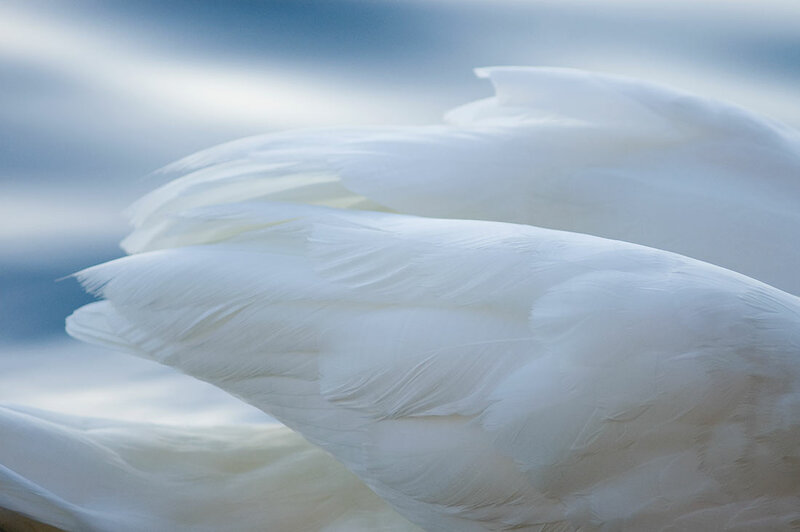 On the other hand, a swan's feathers are entirely white. 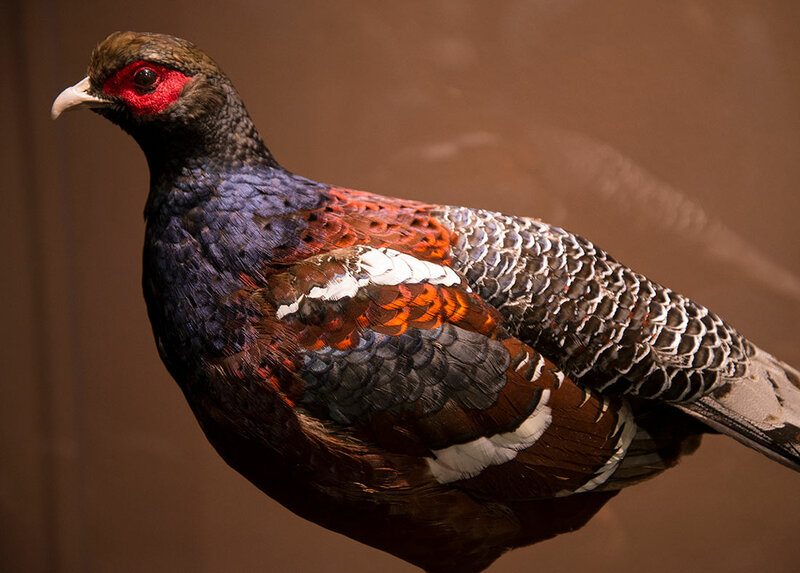 The only other creatures to have feathers were dinosaurs, which the fossil record indicates that birds evolved from. Dinosaur feathers were not used for flight, but probably helped them stay warm and blend into or stand out from their environments. Feathers are considered the most complex of structures that cover the surface of a vertebrate's body. In addition to being various colors for mating purposes, feathers correlate in color with the height at which a bird builds its nest. Females usually have colors that enable them to blend into the nesting environment, and birds that nest on the ground tend to have duller colors to avoid attracting attention to their nests. Birds that nest in the canopies of trees tend to have brighter colors. Scientists believe that some birds developed bright feathers because they live in environments with brightly colored flowers and vegetation. Most birds can blend into their environment to avoid being eaten. The variety of colors of feathers is greater than the variety of plant, leaf and flower colors. The study of feathers is a branch of science called plumology. Commercially, down feathers are used in expensive pillows and blankets, winter clothing and sleeping bags for their insulating properties. Feathers also are used on arrows to help them fly and to decorate fishing lures. Large bird feathers have long been used to make quill pens. The word "pen" comes from the Latin word penna meaning feather. Feathers are used in a variety of industrial products. Some species became endangered because they were hunted for their beautiful feathers, which ended up on women's hats during the 19th and early 20th centuries. 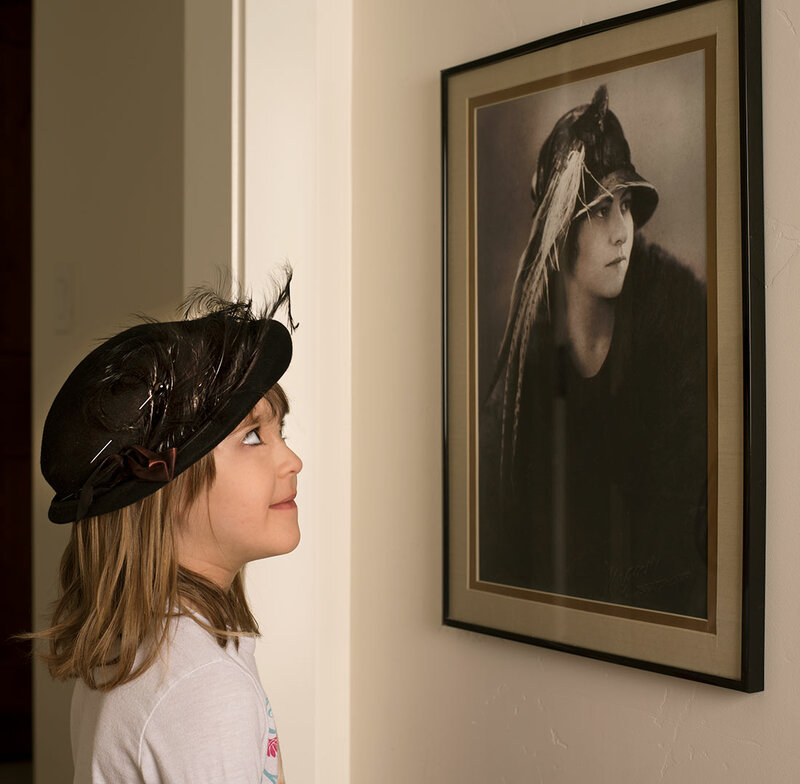 Four-year-old Maia Espinosa, wearing a vintage feathered hat from the early 1920s, views a photograph of a relative from the same era wearing a plumed hat. Feathers have religious meaning in some cultures such as some Native American tribes. 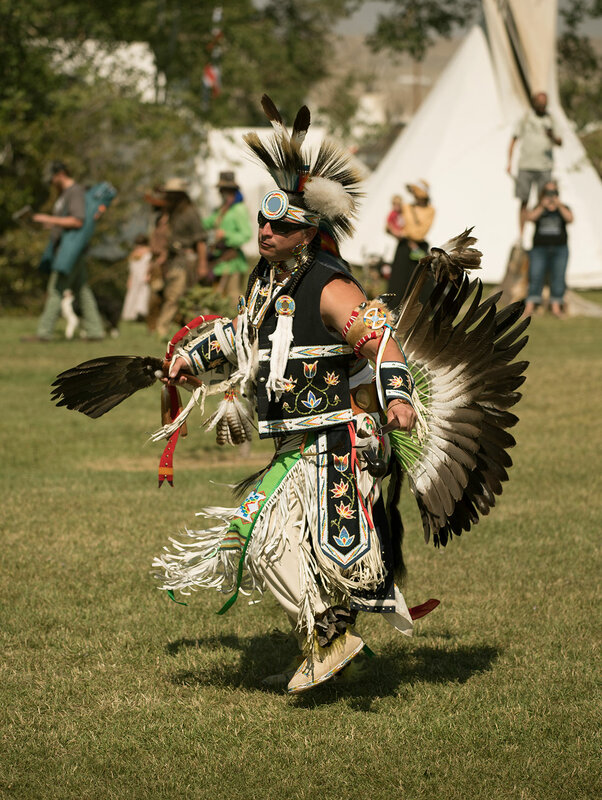 A Native American dancer in Wyoming with feathers as part of his costume. Forrest and Donna Anderson are writing an illustrated book of nature photos. Buy stock photos of birds.